Brian J. McKinnon, M.D., MBA, M.P.H., gives the inaugural Sharon and Dr. Ted Bailey Distinguished Lectureship in Otology at UAMS, hosted by the Department of Otolaryngology – Head and Neck Surgery. He encouraged physicians to take an active role in the business aspects of medicine. 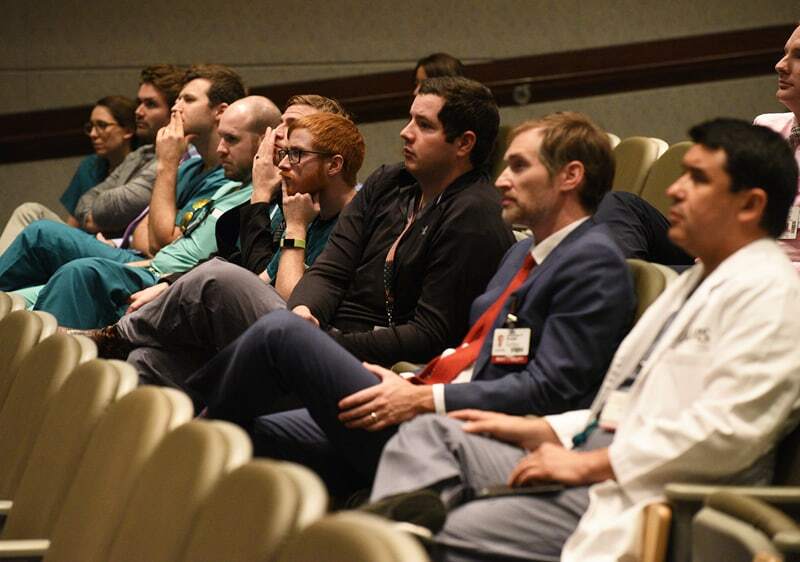 Aug. 28, 2018 | Aug. 28, 2018 | Physicians must be actively involved in the business of medicine to provide better patient care, said Brian J. McKinnon, M.D., MBA, M.P.H., as he gave the inaugural Sharon and Dr. Ted Bailey Distinguished Lectureship in Otology at UAMS. McKinnon, a national expert in cochlear implants and the business of medicine, said physicians need to recognize and take ownership of this responsibility. The lecture was held in the UAMS Winthrop P. Rockefeller Cancer Institute’s Sam Walton Auditorium. McKinnon is an associate professor and vice chairman in the Department of Otolaryngology – Head and Neck Surgery and associate professor of neurosurgery at Drexel University College of Medicine in Philadelphia. He is a leader in both scientific research on cochlear implants and on the business of establishing sustainable cochlear implant medical programs for adults and children. 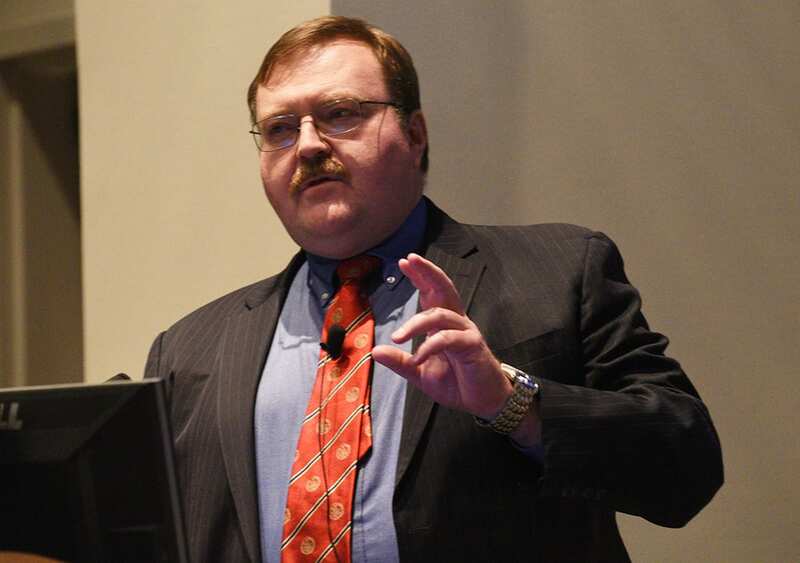 He has worked for the White House Medical Unit and serves as a consultant to several organizations, including the U.S. Food and Drug Administration. He earned his Master of Business Administration from Johns Hopkins University. McKinnon’s Aug. 24 lecture at UAMS was hosted by the UAMS Department of Otolaryngology – Head and Neck Surgery and held in the UAMS Winthrop P. Rockefeller Cancer Institute’s Sam Walton Auditorium. McKinnon used his own story to illustrate how important the business of medicine can be. In 2006, McKinnon had accepted a position in otology/neurotology at Georgia Health Sciences University, but the cochlear implant program closed shortly before his arrival. It had lost $900,000 over seven years. McKinnon realized that if he wanted to provide the life-changing surgeries he was trained to do, he would have to re-open a cost-effective and self-sustaining version of the program. McKinnon went to work. He re-opened the adult program and was able to show enough success that he was able to re-open the pediatric program in 2010. A key factor was an agreement with a cochlear implant vendor – an idea he got from an academic paper from UAMS published around the same time period describing similar strategies used to rebuild the implant program in Arkansas when faced with similar challenges. McKinnon performed surgeries involving only one device to reduce redundancy. He guaranteed the vendors volume. Aggressively managing costs and revenue. Understanding patient demographics and market factors, including market size and the likely number of candidates for surgery in the market area. Researching how patients in the market are paying for health care and understanding the reimbursement rates for each group to develop an ideal mix. Pinpointing materials and labor costs as well as fixed/overhead costs. Working to reduce surgical costs. Renegotiating managed care contracts to improve payment amounts. Aggressively following up with insurance and Medicare/Medicaid to ensure payments were received. Aggressively pursuing the target market through advertisements, public talks and integrating into the community. McKinnon said physicians cannot be shy about advocating for themselves, their services, and their programs. John Dornhoffer, M.D., chairman of the UAMS Department of Otolaryngology, welcomes McKinnon and thanks Sharon and Ted Bailey, who provided the funding for the educational event and others to follow. 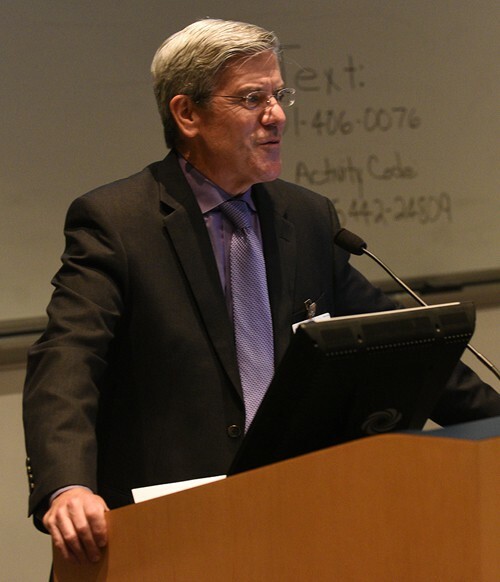 John Dornhoffer, M.D., chairman of the UAMS Department of Otolaryngology – Head and Neck Surgery, echoed many of McKinnon’s statements and said such thinking had been key to the success of or revival of UAMS cochlear implant here. 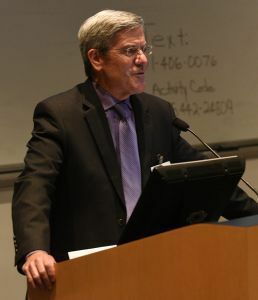 Dornhoffer said it was a fitting topic for the inaugural distinguished lectureship, which was established in spring 2018 by a $150,000 gift from Sharon and H.A. Ted Bailey, M.D. The Baileys were responsible for many “firsts” in Arkansas ear surgery, including the first cochlear implant surgery. Ted Bailey, a 1947 College of Medicine graduate, taught UAMS medical students and residents for many years. Sharon Bailey worked with him as an audiologist. Ted Bailey oversaw the Department of Otolaryngology for several years when it was still a division. The Baileys have been steadfast UAMS supporters for decades.